Grab a stool and a bucket to get a'milkin'. Click here to play! Though you should be aware that this is no ordinary cow. It's the cash cow and instead of milk, you'll be filling buckets with plenty of major cash prizes! In this traditional 3 reel game, Bessy the cash cow pays out the most. Spin three of her across the single pay line and you'll score a major fortune � up to 10000 coins to be exact! She also acts as a multiplier, tripling your win if she appears in a winning line. There are plenty of other symbols to help you build up a fortune. Three buckets full of golden coins will bring in up to 90 coins. If you can spin three piles of cash across the pay line you'll get up to 75 coins. Triple, double, single or any combination of BARS will also bring in pretty decent wins. You'll have to bet the maximum of three coins in order to activate the highest pay table. Bessy is waitin' to pay out big in this fun slots game. 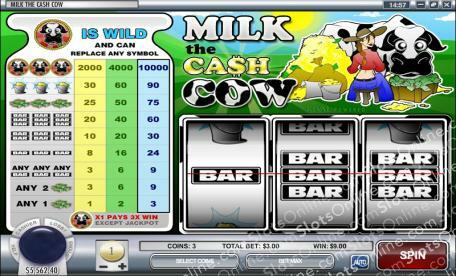 Milk the Cash Cow for a chance to bring in plenty of big wins! Bessy the cash cow acts as a scatter. If you spin her in any winning combination (excluding the jackpot) and your win will be tripled.